2 1901 Early in 1901, The Rev. Lacklan C. Vass II was asked to assemble the steamship which had been christened S.N. Lapsley. Although not a shipbuilder, Rev. Vass unloaded the five carloads of parts at Leopoldville in March and worked at rebuilding the boat. On April 2, 1901, the S.N. Lapsley made her trial trip to Luebo successfully. 5 1885 On Easter Sunday, April 5, 1885, Presbyterian ordained minister Horace G. Underwood (shown at right ) arrived in Seoul, Korea. Underwood joined Dr. Horace N. Allen, a medical missionary for the Presbyterian Church (USA), who had arrived in 1884. 7 1867 On April 7, 1867, the Catawba Presbytery met in the Presbyterian Church in Charlotte. Led by the Rev. Samuel C. Alexander (shown at left ) and the Rev. Willis L. Miller (shown right), the presbytery approved creation of a college for African-Americans with these two ministers as teachers. Mrs. Mary D. Biddle of Philadelphia, PA, pledged $1,400 to the school. In appreciation of this first contribution, the newly established school was named after her late husband, Major Henry Biddle. From 1867 to 1876, the school was named Biddle Memorial Institute and chartered by the state legislature. The charter of the school was amended on March 1, 1923, by the Legislature of the State of North Carolina to be renamed Johnson C. Smith University. 12 1902 On April 12, 1902, Rev. Thomas DeWitt Talmage died. The pastor of Central Presbyterian Church in Brooklyn, his fiery oratory led the church to a growth in membership to more than 5,000, while his sermons were printed in newspapers across the country. He was the founding editor of Christian Herald, and continued as editor of this widely circulated Protestant religious journal from 1877 until his death in 1902. 13 1907 On April 13, 1907, Montreat's first standalone post office building was opened. Montreat's postmaster when this building opened was E. D. Lansing. 14 1795 On April 14, 1795, a new presbytery  called the Presbytery of Huntingdon  was organized at the direction of the General Assembly from "all ministers and congregations occupying the central part of Pennsylvania, and now comprised within the limits of 15 counties." 15 1911 On April 15, 1911, Henry Alexander White wrote the preface for his new book, Southern Presbyterian Leaders (1683 - 1911). 16 1835 In Little Rock, on April 16, 1835, the Presbytery of Arkansas was formed. The Presbytery included the eastern part of Indian Territory, James Wilson Moore and two missionaries to the Choctaw Nation, Rev. Alfred E.Wright (shown at right) and Rev.Loring S. Williams, were present. Wright and Williams had worked on a written Choctaw language as well as setting up schools in Mississippi, and later in Oklahoma when the tribe was moved by the Federal Government. 17 1735 On April 17, 1735, the Rev. Samuel Hemphill was put on trial by the Synod of Philadelphia on charges of not adhering to the Adopting Act of 1729 requiring ministers to essentially agree with the Westminster Confession and Catechisms. The trial was highly publicized, with Benjamin Franklin defending Hemphill in his newspaper, although he did not argue that Hemphill had preached according to the Westminster Confession. The synod dismissed Hemphill later that year, and Hemphill went into obscurity. Franklin left the Presbyterian Church he attended, although he continued financial support of its ministers for some time. Franklin attended the Anglican Christ Church. 18 1833 On April 18, 1833, Elijah Parish Lovejoy (Nov. 9, 1802 - Nov. 7, 1837) was ordained by the Second Presbytery of Philadelphia. The Presbyterian minister and abolitionist newspaper editor was killed in Alton, Illinois, on Nov. 7, 1827, while he was defending his printing press. 19 1865 On April 19, 1865, Abraham Lincoln's funeral at the White House was held shortly after noon. About 600 guests entered the same way the public had the day before  through the crepe-covered South Portico and the Green Room and into the candle-lit East Room. Rev. Dr. Phineas Gurley, pastor of the New York Avenue Presbyterian Church, delivered the eulogy: "Probably no man since the days of Washington was ever so deeply and firmly imbedded and enshrined in the very hearts of the people as Abraham Lincoln. Nor was it a mistaken confidence and love. He deserved it  deserved it well  deserved it all.... He was simple and sincere, plain and honest, truthful and just, benevolent and kind. His perceptions were quick and clear, his judgments were calm and accurate, and his purposes were good and pure beyond a question. Always and everywhere he aimed and endeavored to be right and to do right. His integrity was thorough, all-pervading, all-controlling, and incorruptible." 20 1848 On April 20, 1848, Geneva Hall opened in Northwood, Ohio. Started as a school by the pastor of the Miami Reformed Presbyterian Church, Geneva College was moved in 1880 to Beaver Falls under the sponsorship of the Reformed Presbyterian Church of North America. 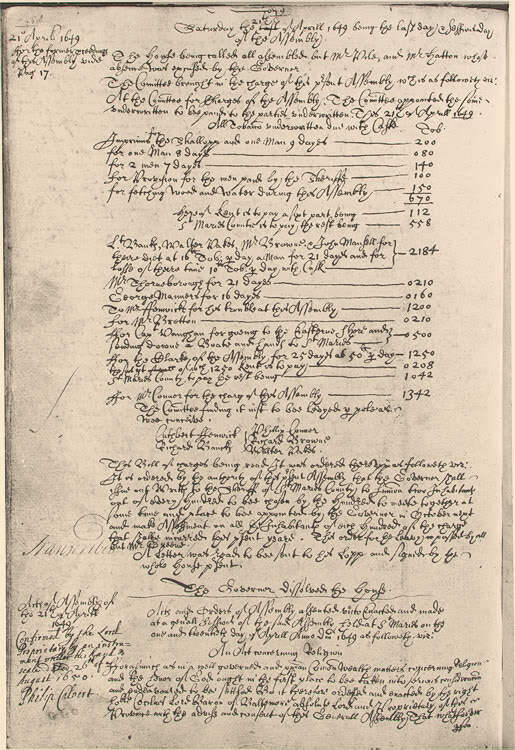 21 1649 On April 21, 1649, the Maryland Act of Toleration (you can click on the image to view a larger photo) was passed providing freedom of religion for all Christian faiths. While the act originally might have been intended to further protect minority Catholics, it also protected Dissenters from the Church of England, including Presbyterians, who greatly expanded their activities in the later part of the 1600s in the colony through the efforts of Rev. Francis Makemie and others. On April 21, 1910, at 6:30 p.m., Samuel Clemens, the well-known author and lecturer Mark Twain, died at Stormfield, his home in Redding, Connecticut. His funeral was held at the Brick Presbyterian Church, New York, and Presbyterian minister and Princeton Professor Henry Van Dyke gave the short sermon. 22 1688 On April 22, 1688, Jonathan Dickinson was born in Hatfield Massachusetts. Graduating from Yale College in 1706, he studied Theology and was licensed to preach. He went to Elizabethtown in New Jersey in 1708 and was ordained in 1709. He joined the Synod of Philadelphia in 1717. The College of New Jersey (now Princeton University) began in 1746 and met in Dickinson's house in Elizabethtown. After Dickinson's death in 1747, the college moved to Newark, and in 1756, it moved to Nassau Hall at Princeton. The purpose of the college was to educate men for the ministry. The Rev. Jonathan Dickinson died on October 7, 1747. 23 1858 On April 23, 1858, Horace Newton Allen was born in Delaware, Ohio. He became the first Presbyterian missionary to land in Korea in 1884. A doctor, Allen served as the medical officer to the Korean Court and provided medical missionary services. He held various government positions and is the author of a number of books on Korea. 24 1920 On April 24, 1920, Sunday school superintendent at Calvin Presbyterian Church (Philadelphia) and hymn writer Eliza E. Hewitt died. She wrote at least 72 hymns. 27 1708 On April 27, 1708,the founding "father" of American Presbyterianism, Rev. Francis Makemie signed his last will. He died sometime between April 27 and August 4, 1708. 27 1757 On April 27, 1757, Rev. John Martin  the first Presbyterian minister ordained in the colony of Virginia  was called to the Albermarle (Virginia) church. On January 25, 1758, Reverend Martin was appointed the first Presbyterian missionary to the Cherokees. But with the Cherokees joining the French, the mission was abandoned. Martin settled in South Carolina. 30 1943 On April 30, 1943, a group of Axis diplomats, business executives and families were transferred from Assembly Inn as part of the World War II repatriation exchange program for American diplomats, missionaries and families. Click to see a special report.